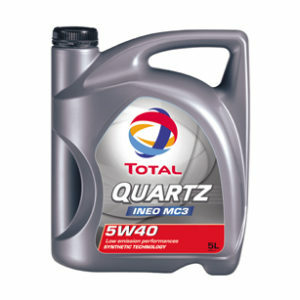 Total Quartz Ineo First 0W30 is used by PSA Peugeot Citroen as their first fill engine oil and is also recommended by PEUGEOT and CITROEN in after sales. This pollution-control synthetic technology engine oil provides engines with the best possible protection against wear and clogging. The post-treatment systems, sensitive to the lubricants used and expensive to maintain, are also protected over the long-term thanks to the Low SAPS formulation (low content of sulphated ash, phosphorus and sulphur contents). 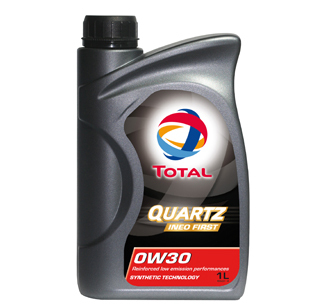 Total Quartz Ineo First 0W30 is particularly well-suited for use with recent engines of PSA, and particularly ones equipped with e-HDI using Stop & Start technologies, and hybrid engines which require new-generation engine oils. * Before using the product, the vehicle’s maintenance guide should be checked. Oil changes should be carried out in accordance with the manufacturer’s recommendations. * The product should not be stored at temperatures over 60°C. It should be kept away from sunlight, intense cold and extreme temperature fluctuations. * If possible, the packaging should not be exposed to the elements. Otherwise, the drums should be laid horizontally in order to avoid any contamination from water and to prevent the product’s label from rubbing off. * Reduced environmental impact: Fuel savings of 3.33% as measured by the official M111 FE test and savings above 4.2% as measured during the NEDC cycle compared with a 5W-40 grade oil in compliance with the ACEA A3/B4-08 test, the official test used for measuring CO2 emissions. It guarantees compliance with all the levels of performance claimed by PEUGEOT and CITROEN in relation to environmental standards. * Protection for pollution-control systems: This lubricant also optimises the way in which three-way catalytic converters and particulate filters operate, preventing them from getting clogged up with soot or sludge deposits. This reduces particulate emissions, NOx, HC and CO in particular. * Engine protection and cleanliness: This oil offers the best possible protection in its category against wear and clogging as soon as the engine is started up. 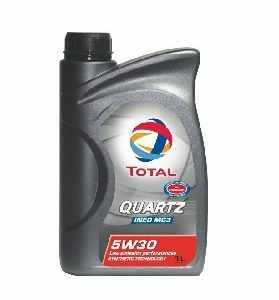 * Oil change intervals: TOTAL QUARTZ INEO FIRST 0W30 retains all of its properties, in accordance with the service plans recommended by PEUGEOT and CITROEN.